IDLE is an integrated development environment (an application like a word processor which helps developers to write programs) for Python. 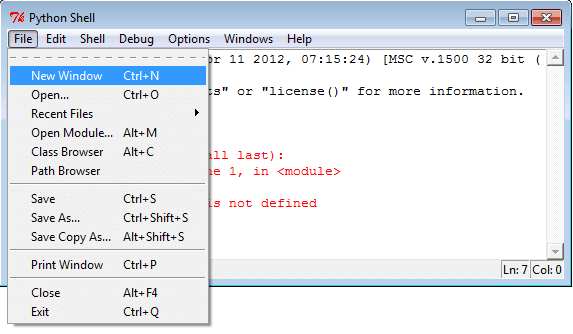 IDLE is the Python IDE which comes with Python, built with the tkinter GUI toolkit. It has two modes Interactive and Development. 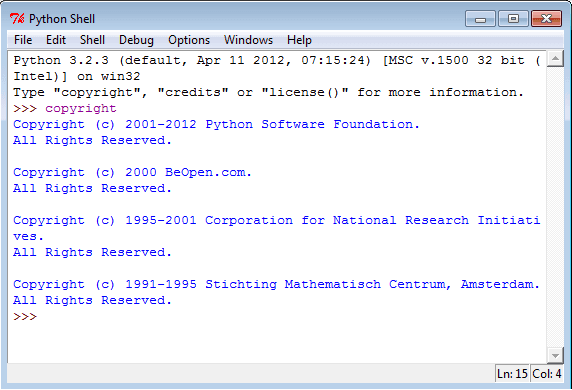 Let us assume that we've already installed Python (here we installed Python 3.2 on a standard pc with windows 7 OS). 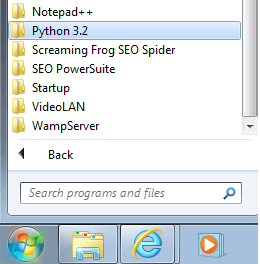 Click on start button and find Python 3.2 tab in installed programs. Now clicking on Python 3.2 tab you can see the Python program development tool named IDLE (Python GUI). To start IDLE click on IDLE (Python GUI) icon, you will see a new window opens up and the cursor is waiting beside '>>>' sign which is called command prompt. 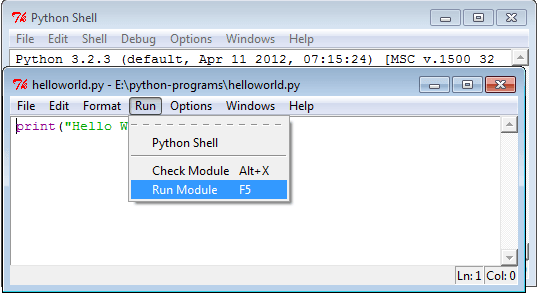 This mode is called interactive mode as you can interact with IDLE directly, you type something (single unit in a programming language) and press enter key Python will execute it, but you can not execute your entire program here. 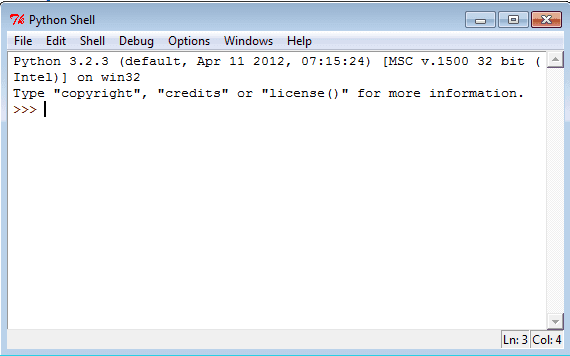 At the command prompt type copyright and press enter key Python executes the copyright information. Now Python is ready to read new command. Let's execute the following commands one by one. 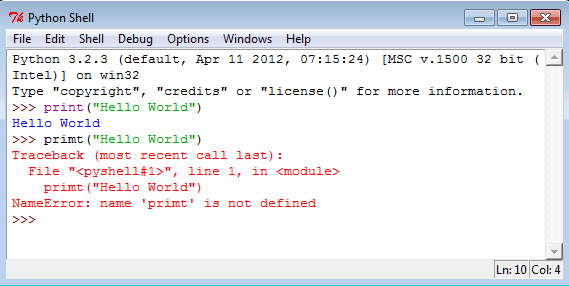 The first command is correct and but the second one has a syntax error, here is the response from Python. Recent Files : List of recently open files. Path browser : Show sys.path directories, modules, classes, and methods. Go to file/line look around the insert point for a filename and line number, open the file, and show the line. At first, start with a new window. Clicking on "New window" under file menu a new window will come. 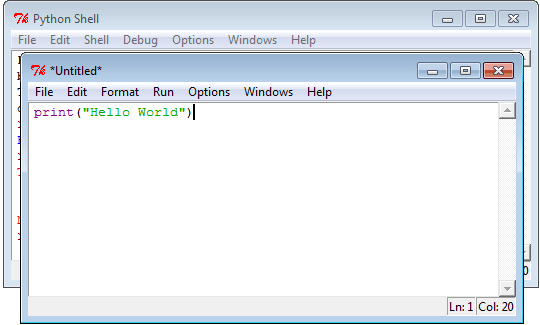 Type print "Hello World" in the new window. 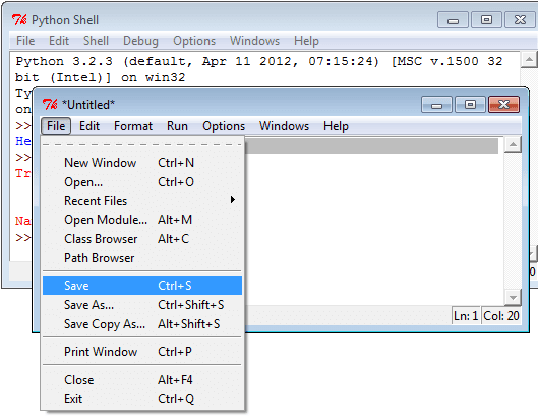 Let's save (Save command is located under the File menu) the file now. 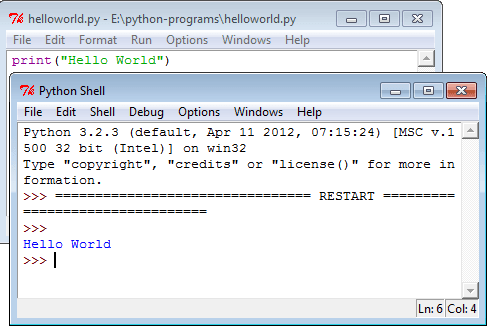 We save the program as helloworld.py under E:/python-programs folder. To run the program select Run menu. Now click on Run Module or press F5 as a shortcut key to see the result. There are some users who prefer command line intersection, rather than a GUI interface. 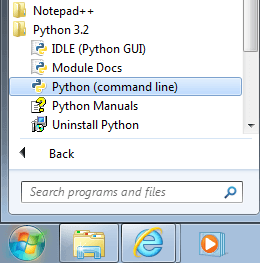 To go Python command line, click on Python 3.2 tab then click on Python(command line).